What is Dentin Hypersensitivity (sensitive teeth)? Dentin hypersensitivity, more commonly referred to as sensitive teeth, can be defined as short, sharp pains that come from exposed dentin (the second layer of the tooth beneath the hard enamel that contains the inner pulp). Individuals with sensitive teeth may find that the pain can be triggered by hot, cold, sour, or sweet beverages or foods, forceful brushing or flossing, or even by cold air. Tooth sensitivity is caused by the movement of fluid within tiny tubes located in the dentin, which results in nerve irritation. When the hard enamel of a tooth is worn down or gums have receded, the surfaces of these tiny tubes can become exposed, resulting in pain while eating or drinking certain foods, such as ice cream or hot coffee. Dentin hypersensitivity is one of the most common complaints among dental patients. One in five people in Canada experience dentin hypersensitivity at some point in his or her life. Excessive consumption of acidic beverages, such as orange juice or cola, can wear down or erode hard enamel and put you at risk for dentin hypersensitivity. Limiting your consumption of acidic foods and beverages can prevent the erosion of hard enamel. Conditions such as bulimia nervosa and acid reflux also can have similar erosive effects on tooth enamel. Abrasion of the enamel from aggressive use of a toothbrush also can lead to dentin hypersensitivity. 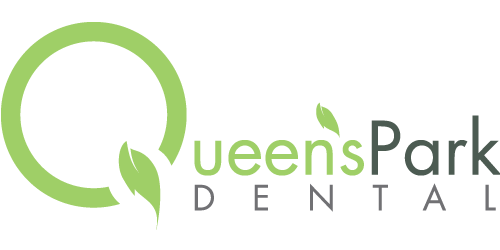 Call us at Queen’s Park Dental if you experience tooth sensitivity. Dr Murphy or Dr Shivji can monitor the condition and can help remedy the sensitivity. What can I do to prevent my Dentin Hypersensitivity pain? Using a soft-bristled toothbrush and brushing in a circular motion will minimize enamel abrasion and thus reduce sensitivity. Using toothpaste containing a desensitizing agent that protects exposed dentin by blocking the tubes connected to nerves can alleviate pain. In-office treatments, such as topical agents or sealants, can be applied by a dentist to help reduce sensitivity. Of course, limiting your intake of acidic foods and beverages is always recommended.